Paraneoplastic syndrome is a set of symptoms that occur with cancer, due to substances a tumor secretes or due to the body's response to a tumor. They are more common with some types of lung cancer, such as small cell lung cancer, and squamous cell carcinoma of the lungs, and may sometimes cause the first symptoms of the disease. The symptoms vary widely depending on the particular substances responsible, and may include symptoms of high calcium, symptoms of a low sodium level in the blood, symptoms related to a high cortisol level, and others. Treatment usually focuses on treating the underlying cancer while managing the symptoms, such as high calcium. Paraneoplastic syndromes occur in around 10 percent of people with lung cancer. They can involve virtually any body system (discussed more below) and are symptoms that are not ordinarily associated with lung cancer. Symptoms from these syndromes may be the first symptoms of a lung cancer, arising well before symptoms of the cancer itself. Hypercalcemia as a paraneoplastic syndrome occurs most commonly with squamous cell carcinoma of the lungs, a form of non-small cell lung cancer. Hypercalcemia refers to an elevated level of calcium in the blood. Hypercalcemia with lung cancer can be caused by a combination of the cancer secreting a hormone known as parathyroid hormone protein, plus calcium that is released by the breakdown of bone due to cancer being present in the bone. Symptoms can include thirst, muscle weakness, loss of appetite, confusion, abdominal pain, and depression. The best way to treat hypercalcemia is by treating the cancer itself, but making sure people get enough fluids is very important both for the symptoms, and because this syndrome often causes serious kidney damage. Syndrome of inappropriate ADH secretion, or SIADH, occurs most commonly with small cell lung cancer, and is characterized by a low level of sodium in the blood (hyponatremia.) Symptoms can include headaches, muscle weakness, memory loss, and fatigue, but if it occurs very fast or is very severe can cause seizures and loss of consciousness. The best way to treat SIADH is to treat the cancer, and one study found that treating small cell lung cancer with chemotherapy could reduce the symptoms of SIADH in up to 80 percent of people. Specific treatments for hyponatremia (low sodium) due to SIADH may include restricting water intake or using other fluids or medications. Another paraneoplastic syndrome found in some people with lung cancer, called hyponatremia of malignancy, has a different mechanism, but also involves low sodium levels in the blood (hypnonatremia). Cushing's syndrome: An elevated level of cortisol in the blood can cause swelling, high blood pressure, a "moon faced" appearance, and stretch marks (like women may develop in pregnancy) . Acromegaly: In this syndrome, a lung cancer may make a hormone like growth hormone, which in adults can result in the growth of the hands and feet. Hypglycemia: some lung tumors secrete substances that lower blood sugar levels, resulting in lightheadedness and other symptoms of hypoglycemia. Carcinoid syndrome: Some lung cancers, as well as some carcinoid tumors of the lung (neuroendocrine tumors) secrete peptides such as serotonin that can cause facial flushing and diarrhea. Polymyositis/dermatomyositis: An inflammation of the skin and soft tissues may occur, especially with squamous cell lung cancer. Neurological syndromes: There are several neurological syndromes that can represent paraneoplastic syndromes with lung cancer, with one example being cerebellar ataxia, a condition in which inflammation of the brain result in lack or coordination. Kidney disease: Paraneoplastic glomerulopathy is a kidney disorder that may be present with lung cancer as a paraneoplastic syndrome. Paraneoplastic syndromes vary widely in their symptoms, and there may even be several causes of one of these specific syndromes, so treatment will be individual for each one. 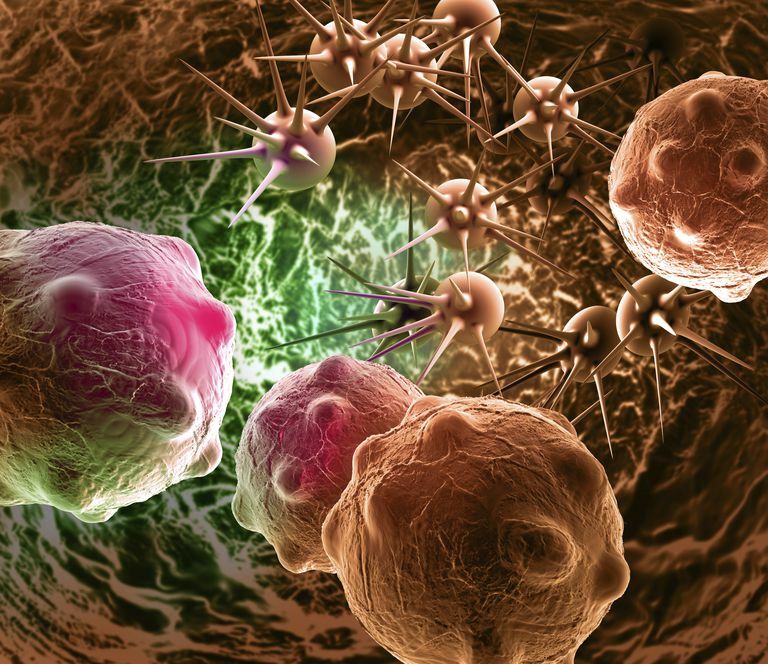 Overall, the best treatment for all of these (especially since the substances causing these symptoms is usually produced by cancer cells or by the body in reaction to cancer cells) is treating ​the underlying cancer. Thankfully, treatments for lung cancer, even advanced lung cancer, have improved in the last few years, and progress is being made even in the more difficult to treat cancers such as squamous cell carcinoma of the lungs and small cell lung cancer. In general, lung cancers that are associated with paraneoplastic syndromes have a poorer prognosis, but this can vary depending on the specific syndrome as well as the type of lung cancer. Pelosof, L, and D. Gerber. Paraneoplastic syndromes: an approach to diagnosis and treatment. Mayo Clinic Proceedings. 2010. 85(9):838-54. Kanaji, N., Watanabe, N., Kita, N. et al Paraneoplastic syndromes associated with lung cancer. World Journal of Clinical Oncology. 2014. 5(3):197-223. Efthymiou, C., Spyratos, D., and T. Kontakiotis. Endocrine Paraneoplastic Syndromes in Lung Cancer. Hormones. 2018 Jul 2. (Epub ahead of print).